Bikes, action and babes – the first trailer of the fifth edition of the Mission Impossible (MI) saga – Rogue Nation is out now. 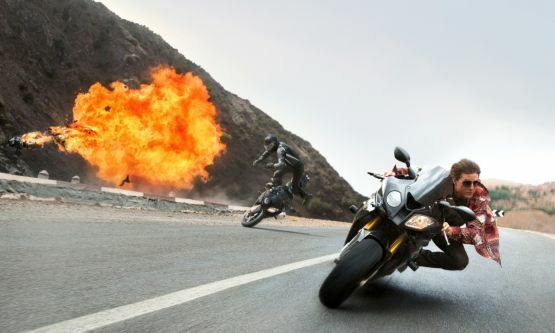 The flick sees the return of Tom Cruise as the iconic agent Ethan Hunt, and in this edition, he’s riding a black BMW S 1000 RR. This isn’t the first time we’ve seen Cruise on a sportsbike in this series either, because in MI:2, Hunt was seen riding the Triumph Speed Triple. Now, in MI:5 the director has Hunt riding an S 1000 RR on a winding mountain road, in an amazing bike chase as seen in the trailer. The 2015 BMW S 1000 RR produces 199 PS at 13,500 RPM and 113 Nm of torque at 10,500 RPM, maybe one of the best performing bikes in the Bavarian manufacturer’s line-up. MI:5 will hit theatres on the 31st of July in the US, and if you want to get a taste of what’s coming, you can check out the MI:5 official trailer right here.